with white complimentary colours. Sure to make any princess proud. When I was younger, I’m talking between 5-15 years old, I was a tom boy. I don’t have any sisters but one brother that’s 2.5 years older than myself. I played with boy toys. I had a boat load of cars, boy helicopters n’ all! Not one Barbie in sight (nor action man! Yes, I was that tom boyish that even an action man was considered a “doll” is our household). I watched F1 racing, rally racing, motorbike racing and even went to a few football games with my dad. My girly side must have come out a lot when I decided to make these cupcakes. I was wanting to do a triple coloured cupcake swirl for a few days and I knew straight away it had to be pink, lilac and white. Those colours just compliment each other. I think they do. I even decided to bake them in funky Polka Dot cupcake cases in red and green. I also coloured the cake batter pink, which I suppose you can’t really tell by looking at the photo alone but if you compare the colours with a regular, I guess it can be seen. I really enjoyed piping these try-coloured cupcakes with the pastel colours. It sent me on a high afterward (but that could just be the sugar rush!) I topped them with a little pearl white lustre dust too which looks invisible in the photos (the sheen on the 2nd photo) but looked beautiful in real life. The recipe I used was the same as my previous Sugarpaste Hearts Valentine’s Cupcakes as I had some batter remaining that I coloured pink. Overly girlie, triple coloured swirl vanilla cupcakes. Pastel shades of pink and lilac with white complimentary colours. Sure to make any princess proud. Preheat your oven to 140°C, 275°F, gas mark 1. Line a tin with 12 cupcake cases. Beat the butter and sugar together with the vanilla extract until the mixture becomes light and fluffy. Add the eggs gradually, beating well between each. Sift the flour, add to the mixture and mix carefully until just combined. Remove the bowl from the mixer and fold gently through with a spatula. Evenly spoon or pipe the mixture into the bases. Bake for around 20 minutes or until a skewer inserted into the centre of one of the cupcakes comes out clean. 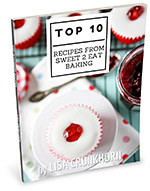 Allow cupcakes to cool thoroughly before decorating. Decorate as desired. For the triple coloured buttercream swirl, I made some buttercream, divided into 3, coloured 2 with a teeny bit of red to create the pink, and the same for the lilac with a teeny bit of violet. I then put the frosting on some plastic wrap and rolled it, sealed one end with a knot (repeat for all colours) then put the 3 different coloured wrapped frosting inside an icing/pastry bag and fitted my nozzle and piped away. Voila! Triple colours in one piping bag. Trying to ram a tall buttercream’d cupcake in my gob and failing, epically! Clean-up on aisle 5 please. These cupcakes are absolutely amazing! I’m delighted with your frosting. I’ve featured this recipes on my blog! I hope you don’t mind! If you don’t agree with that please contact me and I will remove it. All the best. These cupcakes look amazing. I am having a mental blank about the frosting though. I just can’t picture what you are telling me to do. Don’t the different colours get mixed together when rolled in the plastic wrap. In my mind i just see a mixed up mess. I know i am not understanding something properly. Maybe you could email me if youhave a moment with further information or pictures. Thanks very much. I’ve emailed you a detailed explanation, Jennifer.